Raspberry Pi has an in-store treat on its fourth anniversary. It is now shipping the Raspberry Pi 3 computer, which at the same $35 price as its Pi 2 predecessor packs a more powerful 64-bit CPU, and for the first time, has built-in wireless capabilities. The credit-card sized Pi 3 is up to 60 percent faster than its predecessor, which has shipped in the millions. It is the first Pi that can be called a true PC replacement, said Eben Upton, CEO of Raspberry Pi, in a phone interview with the IDG News Service. A new PC-class feature in Raspberry Pi 3 is 802.11a/b/g/n Wi-Fi and Bluetooth 4, which weren’t supported on its predecessors. Wireless communication was a feature users wanted in Raspberry Pi 3 after being relegated to ethernet in previous models. Wireless will make it easier to develop “Nest-like” smart home automation and Internet of Things devices, Upton said. Also new is a 64-bit quad-core ARM Cortex-A53 CPU, which runs at 1.2GHz. The processor is used in mobile devices and even servers, and is a big upgrade from the 32-bit 900MHz Cortex-A7 on Pi 2. The rest of the features haven’t changed from Pi 2. It has an HDMI port, ethernet, MicroSD and four USB ports. It runs a Broadcom VideoCore IV 3D graphics processor that can play 1080p video at 60 frames per second, and has 40 GPIO pins, and display and camera interfaces. About 200,000 Pi 3 computers will be available at launch and buyers will get devices in a few days, Upton said. If the devices run out in the initial rush—which has happened before—Upton said users may have to wait a week or two to get devices. About 100,000 Raspberry Pi 3 devices will be made per week. The Raspberry Pi 3 is compatible with Microsoft’s Windows 10 IoT Core OS and flavors of Linux including Ubuntu. The board will “last us a good year or two,” Upton said. But if there’s a chance to pack better graphics or CPU speed in the $35 price range, Raspberry Pi will go ahead and make the upgrades, Upton said. Raspberry Pi has developed a cult following since the first computer was launched four years ago. It has spawned the development of robots, electronics, gadgets and even a Bitcoin ATM. But Pi 3 will bring a broader set of innovations to the table, particularly with cloud in the mix, Upton said. For one, the wireless features will allow users to build rudimentary smart homes by hooking up Raspberry Pi 3 to Bluetooth-based appliances, lighting or air-conditioning systems. Information from devices could be hauled to cloud services for analysis via wireless. For example, a cloud service could tell a Raspberry Pi to turn an air conditioning system on or off based on data collected from smart meters, which could help cut electric bills. 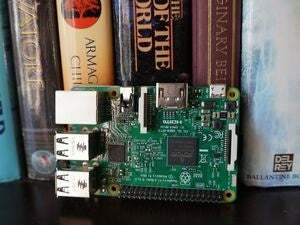 The Pi 3 could also be used to develop home security systems or “health hubs,” where data is collected from health monitoring devices and sent to the cloud, Upton said. It’s much like Fitbit, which sends health information from smartwatches to the cloud, where the data is tracked and compiled to recommend diets and workouts. The new features in Raspberry Pi 3 align well with Microsoft’s Azure cloud service, which will provide remote automation, security, analytics and other services. Azure works hand-in-hand with the Windows 10 IoT Core OS. However, some key features like ZigBee — which is key to home automation and IoT—are missing from Pi 3. Zigbee could have been included in the $35 price, but Bluetooth is the future of short-range wireless communications, Upton said. Raspberry Pi is also planning a modular version of the Pi 3, which will have similar capabilities but be packaged in a board that could be installed inside computers. A shipping date for the board wasn’t provided. Many IoT platforms like Google’s Brillo and ARM’s mbed are also emerging for users to develop connected devices that rely on cloud services. Upton said support for more IoT platforms will come to Raspberry Pi 3.